I'm a bit of a geek when it comes to collecting ticket stubs. After a show I pop them in an old designated shoe box and then occasionally I sift through them laughing at how my taste in music has changed or how good a show was, they also serve as a good reminder of where all my money went! It's one thing reminiscing by myself but it's a far more fun experience to share those memories with other people (if they're interested!) and that's where concert website Songkick neatly steps in. The newly launched Songkick provides a platform for gathering information in the form of photographs, posters, set lists, reviews and concert stubs for over a million concerts, past and present. It's an absolute must for all you concert going junkies and stub horders. Creating an account is very simple and then should you choose, Songkick can be set up to analyse your itunes/windows media player collection or LastFM profile and then import those details into your Songkick profile to monitor upcoming shows saving you the task of adding each artist one by one - if you like to listen to a lot of music this is a very useful tool and you'll always be in the know when your favourite band is coming to town. 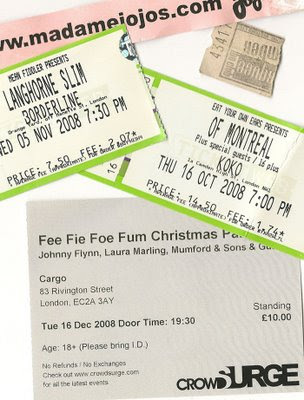 If you have a ticket stub you'd like to share/show off then you simply take a photo of it, find the relevant concert on Songkick and then add it. To give you an idea of how extensive their database is, here is a ticket stub for a Nirvana concert in April, '93 added yesterday - incidentally the guy who added this photo had the most amazingly large collection of ticket stubs I've ever seen, you can see more here. OK, time to snap out of this geek induced ticket stub trance and get back to normal life, now where did I put that ticket for tonight's concert, ah yes it's an e-ticket, damn! I like to collect ticket stubs myself from all the concerts I've been too. I find it funny how my taste in music has changed too, because these concerts range from Peter Frampton to Itzhak Perlman, to the Shins.